Senior housing is at an inflection point, and providers that are in denial about this likely won’t survive as the industry enters its next phase. From its roots as a developer of highly amenitized, master-planned subdivisions, Discovery branched into senior living about 25 years ago. Today, the company’s portfolio includes 56 communities in 14 states, offering the full spectrum of care. 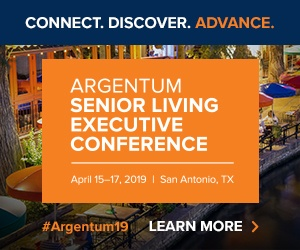 About 60% of its buildings are independent living or senior apartments, and one current focus is expanding that active adult portion of the business. Discovery is also vertically integrated with a Medicare-certified home health care agency, a design firm, a marketing company, and other businesses, including the recently started Discovery Therapy Group. The company has grown at a clip of about 30% a year for the last five years, through a mix of acquisition and development. Discovery maintains an ownership stake in all its buildings and is committed to always doing some ground-up development to support its innovative culture. Hutchinson shared his thoughts about what’s next during a recent interview with SHN at the Senior Living 100 conference in Laguna Niguel, California. He addressed the need for “sharper elbows” in the active adult space, how Discovery is offering more affordable and flexible pricing, and why the days of 97% occupancy might be over for good. I understand that Discovery Senior Living is making a push to expand its active adult portfolio? I think everybody’s realizing, or at least I hope they’re realizing, when the  recession hit and the industry made the mistake — in my opinion — of really focusing on the care aspects of the industry, it changed the customer profile. That’s when your independent living person moved from a 76-, 77-year-old maybe doing golf in one of our communities to an 82-, 83-year-old that might even have a mobility device, et cetera. I think what’s happened is you’re starting to see the Greystars and a lot of the multifamily folks getting involved because we created a void. So, we pushed our customer and our product into the health care side of the world and left that void there. We’re trying to get our elbows sharp and push back a little bit and create that more lifestyle [focused] experience for folks. The future of our business is in customization of experience, and so we want to create a flex lifestyle plan. In fact, we’ve created a flex spending plan in many of our communities so that a person can enter the market at a $1,800 to $2,300 a month price point. I think part of the reason why we’ve only had the 5% penetration for 20 years into this space is because of that price sensitivity. How do you manage that flex spending approach? Unlike 20 years ago when I started this [company], the analytics are there today. One of the reasons why people didn’t do a la carte services back then is they didn’t understand the cost components of each part of the service they were providing. There was mostly a bundled service and you made a net margin at the end of the day, and you managed within the edges of that margin. Now, we’ve created our own business intelligence group inside of Discovery, and we focus on analytics every day. And those analytics show us a lot of things that we hadn’t really had visibility to previously. One of the most important parts is the ability to price effectively each service component you have, so you truly can offer the new customer a menu of lifestyle experiences. So we’re creating these senior apartments with a la carte services or no services, whatever your desire is. But now, we’re able to price those effectively, so we’re crushing our margin. And the driver for me is the fact that, one, we know the boomers are coming. We know they want optionality. We know they want customization. We know they only want to pay for the things they want to pay for. And, as an industry, we have to get away from the silo of the underlying service component, that’s going away. You believe that some big changes are called for, is that fair? It’s time to innovate again. I mean, we are in an inflection point in this industry. That’s my personal feeling … we have to redefine ourselves. Like I said, we’ve got to get our elbows sharp, defend our space, but do it in a way that really is customer-centric … Change is coming, I can promise. To clarify, the $1,800 to $2,300 figures you mentioned, that would be the base rent and then a la carte services are layered in on top of that? Are all the active adult apartment communities in your portfolio ground-up developments? The ones that we’ve done have been greenfield development. So, we are building them, but we’re building them in with some flexibility to add services as they’re desired and needed. So for example, you stubbed in all your commercial kitchen … you certainly create the square footage to expand as you go. You mentioned that senior living shifted to focus more on health care coming out of the last recession. But isn’t that what made the sector so resilient, that it has that need-based component? We now have sovereign wealth funds, pension funds coming through the space, and it was primarily because their yield was relatively protected during the downturn. Well, the next economic downturn that happens, yes, we will definitely have a health care component and that will definitely be, the need-driven side will be, recession resistant. What you’re looking at now is those folks who are moving into independent living at $3,600 month full-service, maybe they can’t afford it. Maybe we need to look at optionality inside of it that says, “Hey, I can get you in at $2,400.” And that is the next recession-resistant piece of our industry. So, it’s protectionist. We’re going to be further down on the pyramid on price point, so we’re just going to have demographics in our favor. And that creates some recession resistance inside of that. And then I think it’s the optionality piece from a consumer standpoint, being able to say, “Okay, something happens in my portfolio. Stock market’s not doing well. I feel less comfortable with spending, do I have to move?” And maybe they’re spending at a $3,200 rate, but they have the ability to work their way down to $2,600 on an a la carte basis and still maintain a good lifestyle. In fact, we created a [program] called Flex Choice Spending. So now, even in our independent living bundled communities — many of them, not all of them — a portion of the rent is now considered flex. So, yes, it’s still part of your rent, but now you get to choose on what you want to do with that money. The next iteration is that, okay, it’s part of the rent but if you don’t use it, it’s credited back against next month’s rent, et cetera, et cetera. But you can only do that if you know your analytics and you can price every piece. Or else you go from a 40% margin to 20%. So, what else does that require? Sophisticated management. I had mentioned the sovereign wealth funds, all those [capital providers]. Guess what? They’re not just bringing cheaper money to the space for fun, they’re going to require operators to be able to be sophisticated, speak analytics, make business intelligence decisions — certainly, overlay the experience and the uniqueness of our industry, but I don’t think gut-feel operations are going to work very well now. You’re going to have local operators who still do a great job because they’re so immersed in the day to day operations. But, a business of scale, a nationwide business, is going to need sophistication. You mentioned that there is still a health care component, even with this move toward the active adult space. In fact, Discovery has a robust health care component, owning a home health company. We’ve reported on other senior living providers that have tried to start home health, but the operations are so different from their core business, they give it up after a while. We made a decision early on that if services are going to be provided in our communities, we need to control the ball, or the outcome. Because one way or another, the experience [residents] have at your community … influences their perception of your property. For seven years, we’ve had a home health care company. And one of the mandates that we’ve had from day one was data collection. And I’m very glad, because CMS [Centers for Medicare & Medicaid Services] and everybody else is now outcome-based, right? So, we are a five-star rated Medicare-certified home health care company, one of only 3% in the country, [and] it all comes from the outcomes and the data and the focus there. The second thing I also had the president of that division do was earn his business. We did create that wall between our senior living operations and that home health care. He had to earn his way into the executive director’s good graces by creating outcomes and being part of the fabric. That naturally was clunky at first, but now he’s got years and years of analytics behind him that show if our Discovery at Home is in a community, what we do is reduce turnover by 4% annually over time. Resident turnover. Which obviously helps the senior housing operator side. But the best part is, being a five-star certified health care agency, we know the quality of the outcomes and the experience for our residents, which is really, really important. [Getting into home health] was an investment, and there’s a couple things about Discovery — one, we explained to our financial partners early on, we are going to be innovative, and we are going to be educative on how we do things. That means you have to be comfortable with maybe a couple hundred basis points in the margin being eroded for R&D, if you will. We invest in our beliefs longer term, and then try not to waver as the tides shift a bit. We have the courage of our convictions, which has helped long term. What’s another example where Discovery has taken a risk and done things differently than other companies? We were one of the first [senior living] companies, probably still one of the only companies, that [has] commission-based sales staff. Our sales force is primarily commission based. And that’s a little different in our industry … It needs a sales system, and it’s robust, but it’s a sound system. So people in other industries can come in pretty easily, that are used to sales systems, and then fit in and understand it. We have a lot of training now, we have corporate training, we have outside training, we have all the training you need. But it’s a little different. We’ve centralized marketing for 25 years. We control every aspect of marketing. One thing that we’ve known for a long, long time is the difference between marketing and sales. One is lead generation, one is lead conversion. They are very different skill sets. So these folks who are trying to combine these two into that [one] uniform who can be great at both of those, that’s hard to do. You get modest results from that. Do you use third-party referral websites? It’s mostly the new communities that have converted over where there wasn’t a sales system or a trained sales person. They’re just effectively waiting for the prospect to come sign the lease. Or it was part of the fabric of the community for so long that there’s no real lead database. Once you do have that lead database, do you phase out the third party? We wean off all third party. They’re very expensive and we have all the data in the world to show that it’s a less than a 1% conversion rate. It’s a terrible conversion rate. Having said that, everybody wants to beat up on those guys. I think they do a great job. They’re just not for us. I think a company of scale should be able to provide their own training, their own sales force, their own lead generation capability that allows them to differentiate their message in a more effective way than a general lead source. However, if you’re a local or you’re a really small regional who can’t afford to do that type of differentiated messaging and that whole infrastructure that goes behind that, then great. You should use [a third party] and let them refer to you. So, I’m not quite as black and white as some people on that. Considering how vertically integrated and data-driven and large Discovery is, with health care and hospitality expertise, it seems like you’d be a good candidate to start a Medicare Advantage plan or get more involved in partnering with health systems and payers. Is that on your radar? From a company standpoint, we are not crossing that line from the seniors housing operator side. We are going to stay private pay. It’s how do we partner with other organizations who are doing that and then make it seamless to the end user, the customer. We are going to do that, and it’s no different than the other end of the spectrum. We’re experimenting with Uber Eats, we’re experimenting with a lot of things on the concierge service side where we’re partnering with somebody else but it will be absolutely seamless to our customer. Or 20, or whatever it is, but we want to provide that experience at a more affordable price and understand that to stay full — again, I mentioned we’re at an inflection point, and my feeling is the days of 97% occupancy, back in the mid 90s, those may be gone. I’m not saying they are, inside of Discovery we fight every day to get that 97%, 98% sweet spot. But it may be that really 93%, 94%, in what is otherwise an infancy [period] of the industry, is great … Maybe it’s 90%. As you’re maturing as an industry, you have new competition. We can learn a lot just by looking at other industries that matured. I see it as opportunity. It’s a fragmented industry, ripe for consolidation by the application of efficient capital. By the application of efficient technology. All of these efficiencies that we can bring, innovation, all of those things that can be brought into a fresh-minted industry, makes it ripe for consolidation and ripe for opportunity. That’s where I think we are. I think seniors housing 1.0 is behind us, it’s now seniors housing 2.0. And you need smart people to come into the industry. It’s driven a lot by the sophisticated capital. We’re growing up as an industry, and that means there’s going to be growing pains. I always say we paid some dumb tax early on with the assisted living stuff, we’re gonna pay some dumb tax here trying to figure out where our space is. But, we’re willing to make that investment. When you say you want it to be seamless to residents, I can imagine how a concierge could coordinate with Uber Eats. Does it hold for Medicare Advantage? Residents on a certain plan could come with questions about their benefits? Yes, in that educational piece, because … we have two customers. We have direct, which is our resident, and indirect, which is their family. We focus a lot on our direct customer. But, then we’ve all talked about, for 20 years, the indirect customer and influencer of these decisions. And then we wonder why it’s capped off at a 5% penetration rate? Because we’re really not taking care of the indirect customer. We’re making them in charge of a lot of the health care [responsibilities], just like if mom or dad were at home. So, in nirvana, if we get it so we are taking care of both the direct and indirect customer and they don’t have to become completely educated on every nuance of the health care world to provide a good life for mom and dad, that would be really good. What does that look like? I don’t know, but we’re starting with the easiest parts, the parts we can control. Obviously the service and concierge parts, that’s natural and that’s in our DNA as Discovery, that’s the easy part, [to be] creative, innovative there, take advantage of everything going on in the world. On the health care side, I think you’d be surprised if you ever visited a Discovery community and you sit in one of these care coordination units that we have … You’ve got your direct care person, you’ve got your home health care, you’ve got your medical director. They may have a PA [physician assistant] in there, to the extent that there’s something serious … all working with our own internal staff. All of that’s happening behind the scenes, and as a presentation to our direct and indirect customers, it’s fairly seamless. With regard to whether it’s inside of their rental fee or it’s going to be reimbursed through the government, sure, we have to educate them on that. But for the first time in a long time it’s almost like they’re [indifferent] to that. And that’s how I want it to be, I don’t want them to worry about who’s paying who for what, just that it’s in there. And that’s happening, there’s a lot of education in there. Most of our residents even have no idea the benefits they have. You’ve emphasized the need for innovation and investment, but there a lot of pressures at the moment from new supply and labor challenges. How are you weathering these headwinds? We certainly feel the occupancy pressures and people going to the lowest common denominator. The worst sales folks in the world all have one common denominator, right? They can only sell price. And so, in this environment, no matter how sophisticated our sales system is, no matter how much training you provide on selling the value propositions, et cetera, someone else can just drop the price so hard that a customer will go at it. Perspective is important right now. This is my third cycle. So, I could push rewind and go back to the two other cycles where there’s a lot of supply added and … yeah, you have to muscle through the 200-, 300-basis point on average occupancy [drop], across your enterprise. And you have to fight. If we look at the industry, everybody kind of has the same type of thing. They may tweak this or that and say that’s a differentiator. It’s really not true. So, we’re trying to differentiate in a tough environment, where the requirements for sophisticated management and experience are hard to come by but needed and required with the new capital in there. We are making headway. In fact, I just got out of a meeting with February results and it’s incremental [improvement]. Why? Because I don’t gut-feel my business anymore. It’s our analytics, it’s our data, it’s our training, our certification, about driving a message, being different. And then pounding the rock and then getting up tomorrow and doing it again and again and again. That’s what management intensity represents. I wonder why people think competition is all of a sudden strange and new. This happens in every industry, ever. So, if you’re afraid of competing, if you’re afraid of the next new building that opens beside you, you’re in the wrong industry.